The tomato seeds I planted a little over two weeks ago have grown to a point of being too tall for me to put the plastic cover over their trays at night. 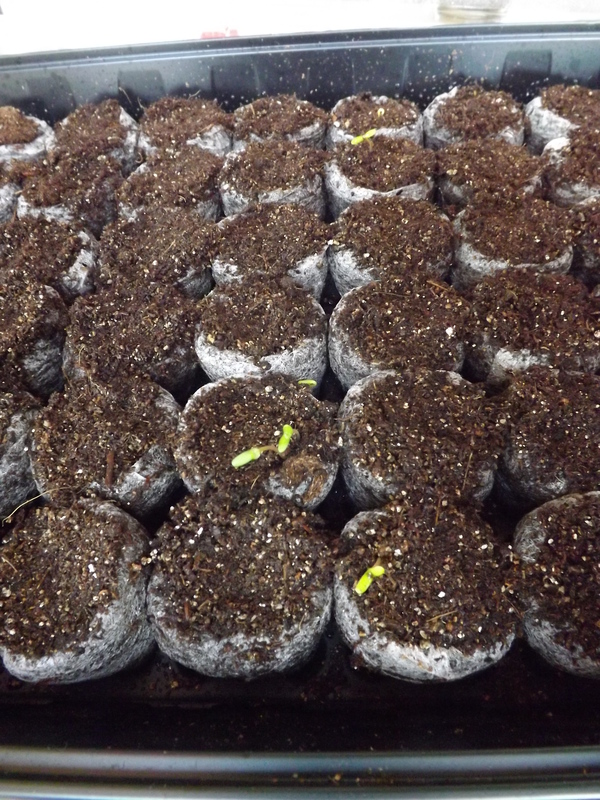 If all the seedlings in these trays were as developed, I would opt to just leave the cover off, but seeing as not all the seeds have even sprouted, it is time to look at my other option – transplanting. This afternoon after everyone was finally out of my hair and busy doing their own things, I decided to pull out my peat pots, potting soil, and plants and begin transplanting. Trouble was, I really had no place to work. Sure I could use the kitchen table or the corner of the dining room table that hadn’t yet been turned into a nursery for seedlings, but with every scoop I made into the bags of dirt, it seemed more dirt was ending up on the floor or carpet. Not a pretty sight. To make matters worse, all I kept thinking about was the potter’s bench out on the patio that I bought last summer and the fact that I wasn’t even using it. The temperatures outside are still too cold to work outside but even if I did dress appropriately, exposing the little plants to the shock of the cold air while transplanting them would surely kill them or at the very least stunt their growth. Well, seeing as Hubby wasn’t home to object, I did what every housewife determined to utilize the right tool for the job would do, I moved the potter’s bench into our great room. Why not? It’s not like it was dirty or anything. Perhaps a bit weathered from the winter, but seeing as I bought the bench near the end of the summer, all I’d managed to do on/in it was to store supplies and trim the tops off some root vegetables before it was time to close it up for the season. Grace and I carried the bench through the door wall and placed it against the windows in the great room overlooking the garden in the back of the house. It’s perfect right where it is. 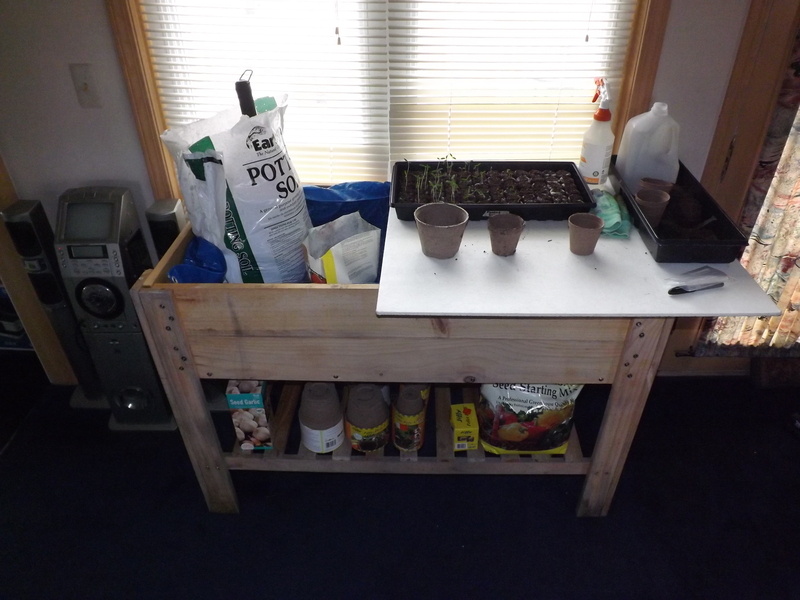 I lined the recessed work area with a plastic tarp, put a firm board across half of the bench so I’d have a work surface above the recessed area to work on, and then stocked the bench with pots, dirt, tools, seeds, gloves, water, and finally plants. It took some time to get everything set up but it was definitely nice to have everything I needed in one place and an area to work in that would confine the mess where it should be, not all over the floor, and keep me dry and warm. 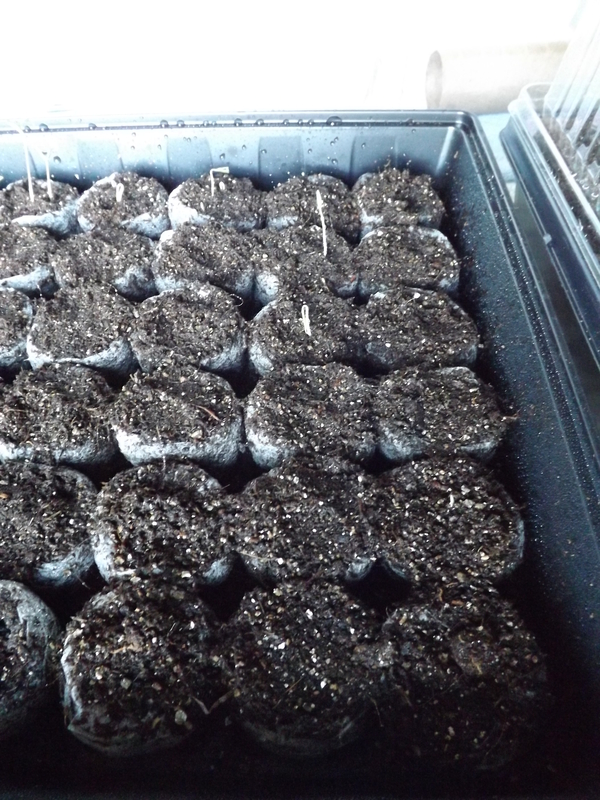 Today I transplanted 17 Beefsteak tomato plants into 3″ and 5″ peat pots. I really wanted 4″ pots, but none of the stores with garden supplies in our area had them. They all had 3″ pots and only one had 5″ pots. I figure I’ll see if the pot size I transplant into will make much of a difference in the long run. Seven plants went into 5″ pots and nine went into the 3″. All the tomatoes were planted deep in the soil, covering most of the stem and leaving only the leaves above the dirt. The plants were at least 3″ tall, some taller. The taller ones went into the 5″ pots. It’s nice to see my seeds growing. 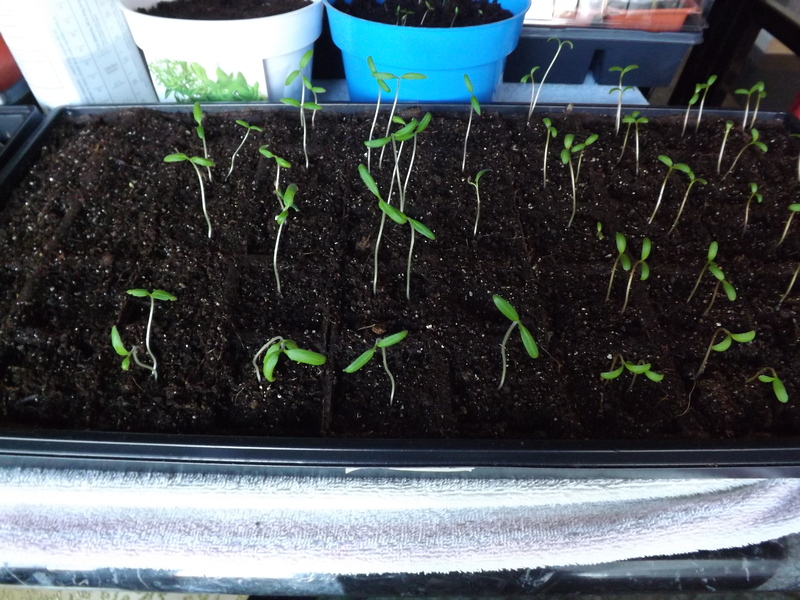 Of the 44 Beefsteak tomato seeds I planted (2 seeds in each of 22 pots/pellets), 18 plants have emerged. I have no idea if this is a good percentage or not, but if all 18 tomato plants survive and bear fruit, I shouldn’t have to buy any tomatoes for canning this year. Plus, I still have Better Boy tomatoes to transplant tomorrow and have about the same number of plants there. Now my next problem is going to be finding room in the gardens for all these plants, but then I’m sure my neighbors wouldn’t turn down a free plant or two. Even though the weather hasn’t been very spring-like yet this March, planting seeds, getting my hands covered with dirt, and watching the seedlings sprout fills me with the hope that Spring promises, and for this I am — Simply Grateful. For the past month I have been on a quest to develop a recipe for the perfect brownie. Trouble is, there already is a perfect brownie — it’s out of a box. Yep, confession time. I love boxed brownies. My grandmother made them; my mother made them; and I have been making them since I was 11 years old. Up until this year, this month in fact, I had never tried making brownies from scratch. I’d had homemade brownies at picnics, parties, and a few friends houses, and although very good, they weren’t what I was used to. They were not boxed brownies. I guess I was somewhat of a brownie snob in expecting a homemade version to be as moist, chewy, chocolatey and irresistible as what I’d been brought up on and come to love. And being the closed-minded person I am when it comes to trying new foods, it was only natural in my quest for the perfect brownie mix that I would do my best to imitate what I was used to. There are so many different recipes for brownies on the internet and deciding where to begin was a challenge in itself. After hours upon hours of reading recipes, deciphering the differences between cake-like, fudgey, and chewy brownies, and comparing everything I’d learned to recipes I’d printed off through the years or collected from friends and neighbors, I began testing recipes. Every week for the past month I have tried a different recipe. Actually what I’ve been doing is closing in on the perfect brownie. With each test, I tweaked the basic recipe I started with, adjusting proportions, changing ingredients, and inching bit by bit closer to my goal. Tonight I made my fourth batch of brownies and think it’s almost there. It is moist, chewy, chocolatey, homemade (not boxed), and the dry ingredients will fit in a quart mason jar for easy storage in the pantry. One goal of this endeavor has been that the final product had to be as easy and convenient as pulling out a box of brownies, adding eggs, oil, and water, and baking. I didn’t want making homemade brownies to be something I had to schedule into my day. Being able to whip up a batch of brownies in a matter of minutes, during a commercial break or five minutes before my guests arrived, was essential. Otherwise making brownies would become something I did only when I had time (which let’s be honest is hard to come by) or on special occasions. Substituting some brown sugar for a portion of the granulated sugar in a recipe will provide more moisture to the final product because of the molasses content. Molasses is acidic and as such will cause baking soda to react in a recipe. Therefore switching out the baking powder for baking soda in brownie recipes is okay as long as you use some brown sugar. Adding a little extra flour makes for chewier brownies. The addition of more oil to brownie batter will make them heavier, thus chewier and more fudge-like. It is better to under-bake your brownies slightly if you want a chewy version. Layer these in a quart mason jar and seal until ready to use. Stir until combined. Pour prepared brownie mix into a greased 13 x 9 pan. Bake in 350 oven for 25-30 minutes. These brownies are nearly perfect — at least in my attempt to make a brownie that is quick, easy, convenient, chewy, and reminiscent of boxed brownies. 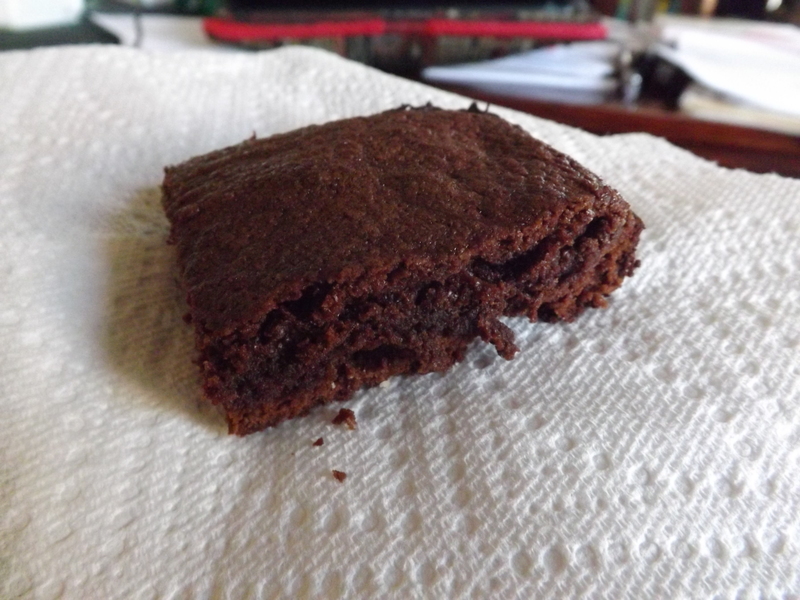 In the end, when I compare my final recipe to the tons of recipes out there for homemade brownies, it is very similar. Many of the differences are based in the type of brownies I’m comparing my recipe to. Cake-like and fudgey brownies seem to be more popular on the recipe sites. Chewy versions were not as abundant. I can’t say that I won’t continue to tweak my brownie recipe, because making brownies every week for the past month on the premise that I was in search of the perfect brownie was a great excuse to have brownies on the counter continually. I’m not sick of them yet, and neither is the family, and for this I am — Simply Grateful. 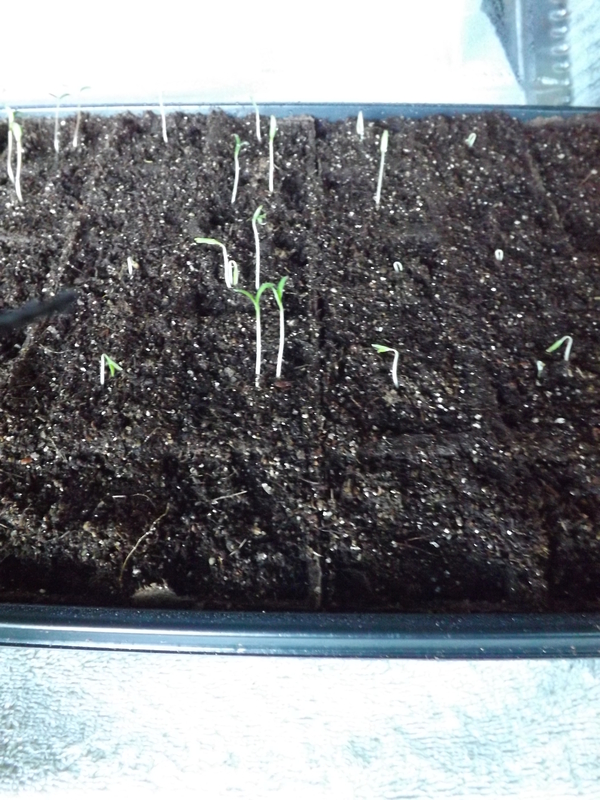 Marigolds and tomatoes are sprouting! I’m a bit behind in my posts, but I’ve been sure to keep up on taking pictures. By day 7 after I planted marigolds, tomatoes, and peppers, all of the marigolds had sprouted and some of the tomatoes had begun. In the Jiffy pots, once again the sprouting was not as fast. Only three plants had emerged. The cardboard planters were far quicker with over a dozen sprouts. Even though the amount of tomato plants sprouting in the two mediums were different, the marigolds caught up, so I was hopeful that the tomatoes would too. 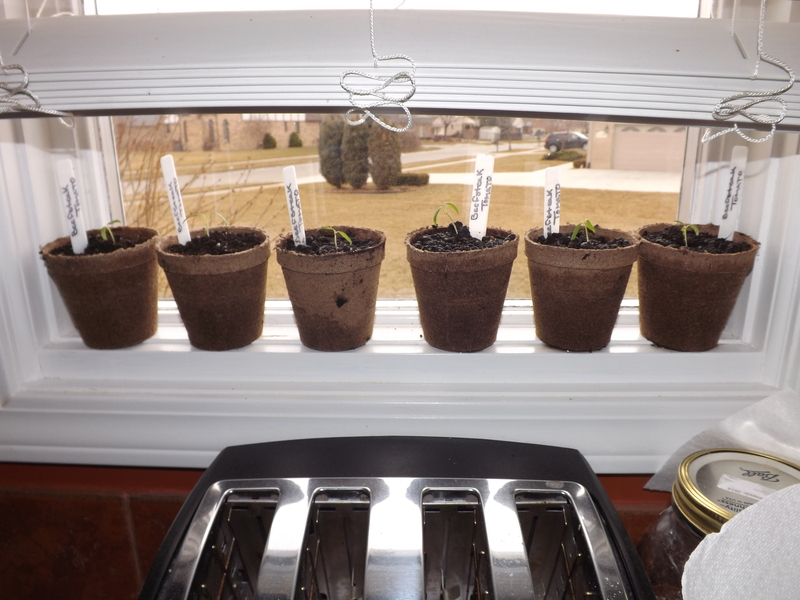 As you can see, by day 11, the tomatoes and marigolds in the Jiffy pots and the cardboard planters were nearly even. I’m getting anxious to transplant these into individual pots…but don’t want to get ahead of myself. According to what I’ve read, I should wait until they have at least two sets of leaves. A week and a half into my home-grown seedling experiment and so far, so good and for this I am — Simply Grateful. Last year with all the canning I did using pineapples, I never thought to try to utilize the core. It’s hard, woody, and not very tasty, so the only thing I could think to do with it was throw it in the compost heap. This year I just couldn’t bring myself to throwing another core away. There had to be something I could do with it. 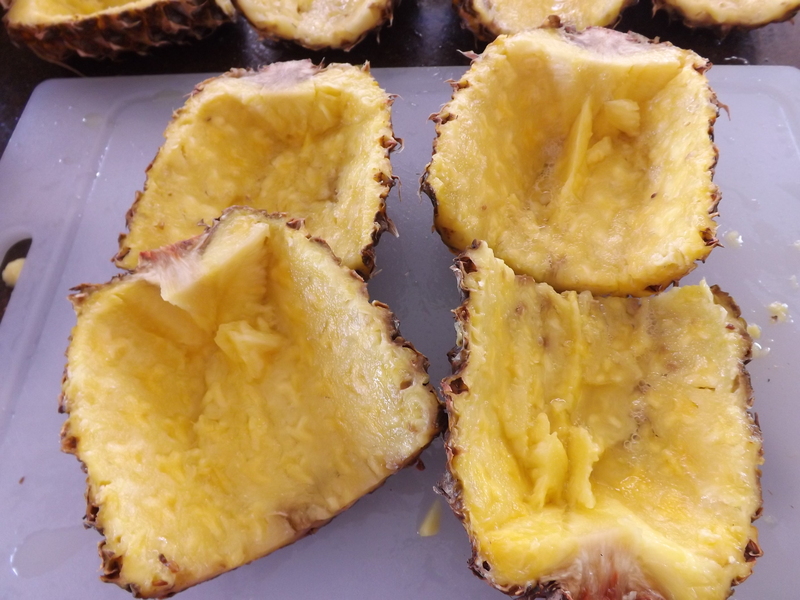 Researching what to do with pineapple cores yielded some interesting options such as freezing chunks of it and using it as ice cubes in drinks, throwing it in smoothies, and the option I opted for — drying it. 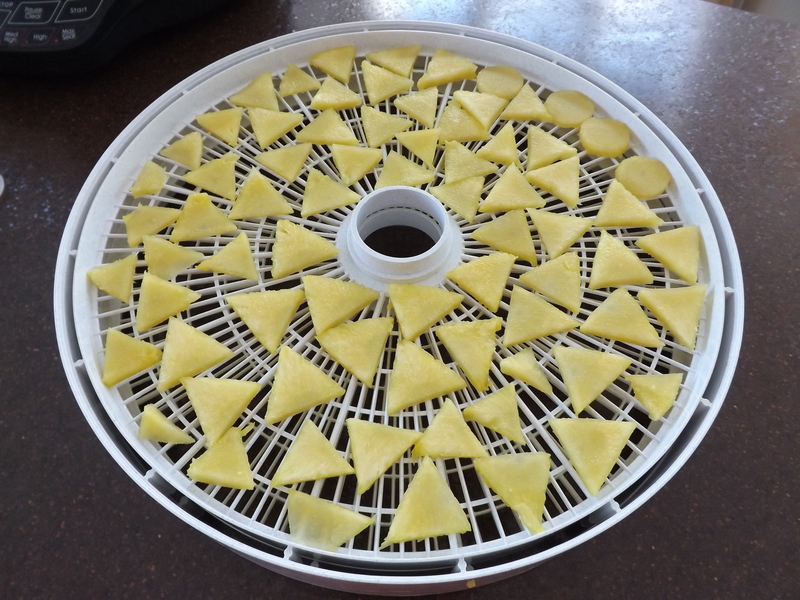 Last year I dried several pineapples, but not the cores. This year I dried only the cores. The salvaged pineapple cores from the pineapples I used to make crushed pineapple. I sliced them thin because cores are tough and woody. 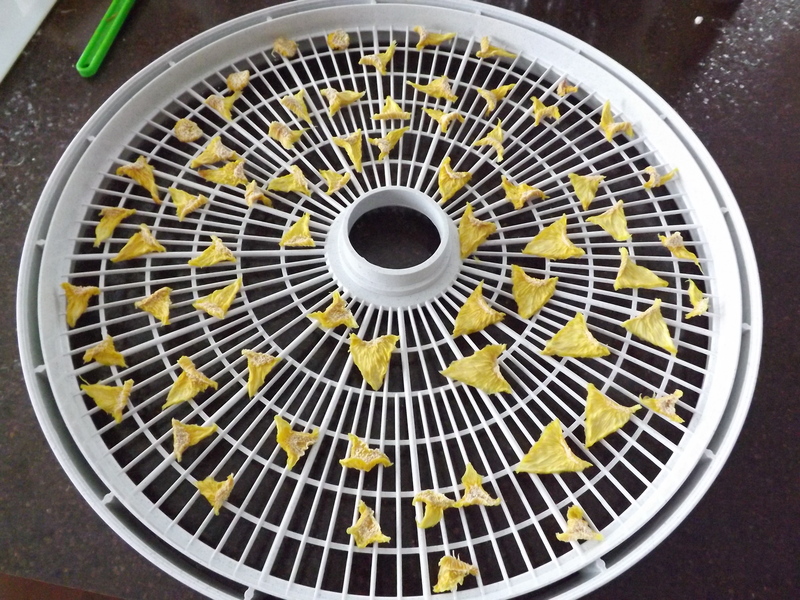 I put the slices in the dehydrator at 135 degrees for about 12 hours until they were completely dry. This is what they looked like after they were dry. The dried core was not woody or tough. 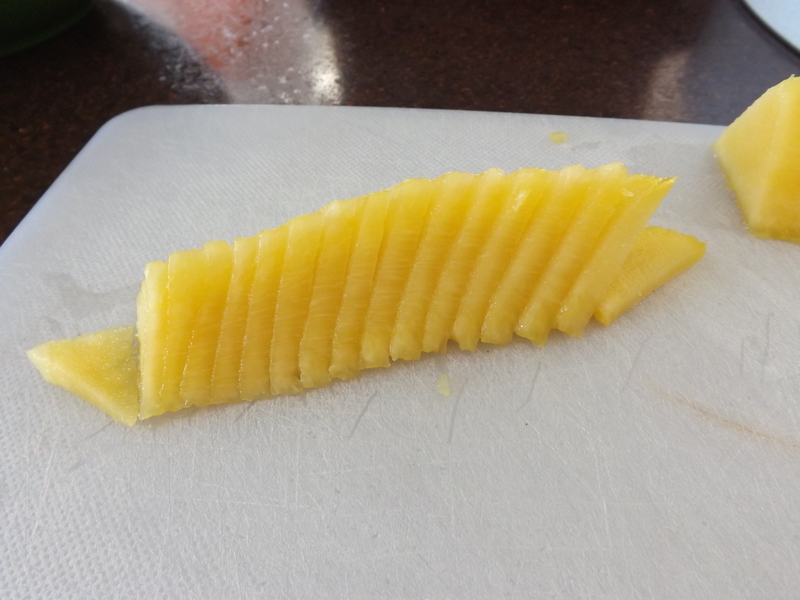 It was not as sweet as when I’ve dried pineapple slices, but it is tasty and will make a nice snack or addition to my granola. Using as much of any food I buy or grow is important to me, so this project is one I will definitely be doing again. Another jar of wholesome goodness for the pantry shelf, and for this I am — Simply Grateful. I love it when pineapples go on sale. 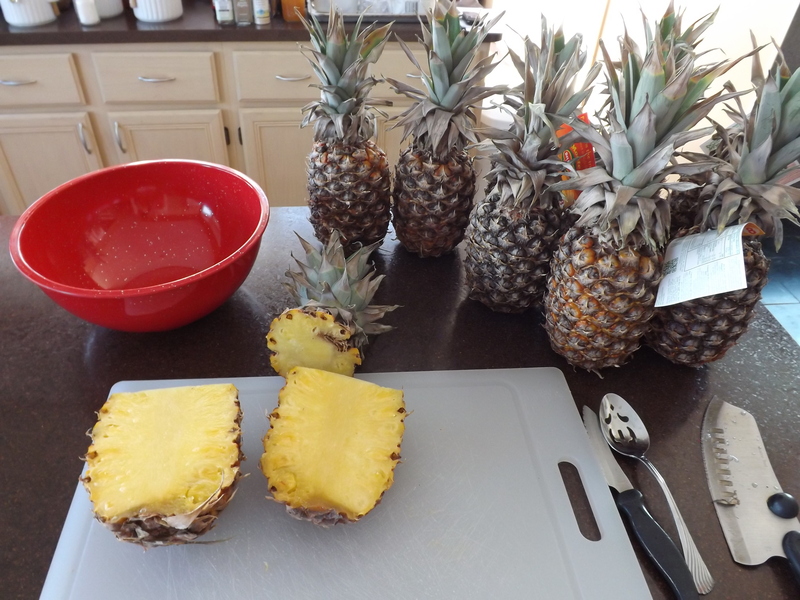 From about the middle of March until the middle of June, we can find pineapples at our local grocery stores here in Michigan for about $1.00 each. Not every week mind you, but during these three months, every couple of weeks one store or another will put them on sale. This is when I stock the pantry with freshly canned crushed pineapple and like to experiment combining pineapple with various other fruits to make new jams, jellies, concentrates, or sauces. 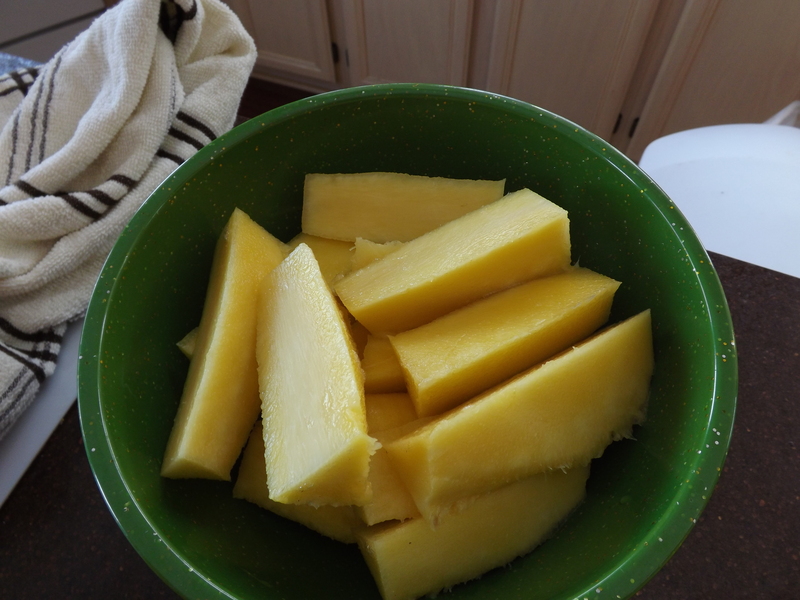 Last year I canned crushed pineapple, but not nearly enough, so when I found pineapples the other day for $.99 each, I bought a dozen of them for the sole purpose of making crushed pineapple. 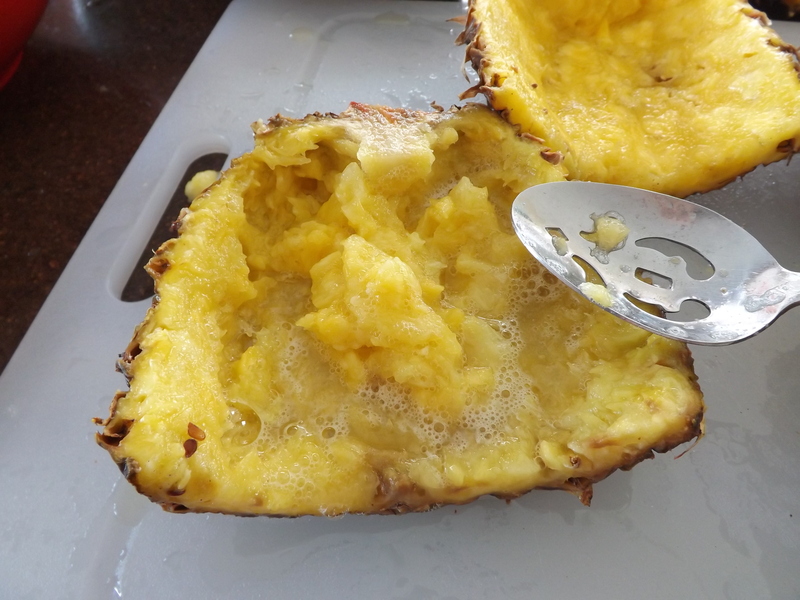 In order to get the most usable fruit out of these pineapples, I opted to cut out the fruit with a knife and then scrape the skins with a spoon. Although I like using a pineapple corer most of the time, I have found this gadget leaves a lot of usable fruit in the skins. 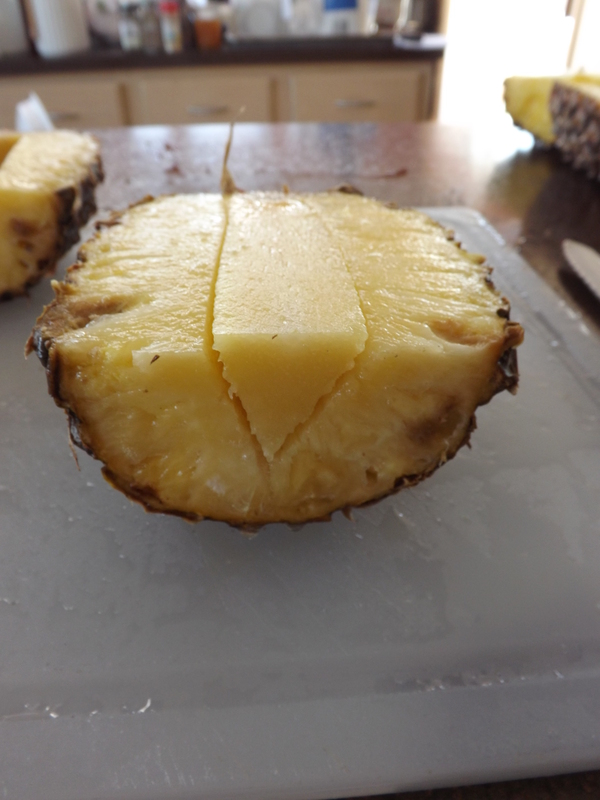 After I cut off the top and split the pineapple down the center, I cut a V in the center of each half to remove the core. Then I cut out the main chunks of fruit from the skin. Even being careful to get as close to the skin as possible, there is still a lot of fruit that can be scraped from the sides. Using a spoon I carefully scrape the skins. 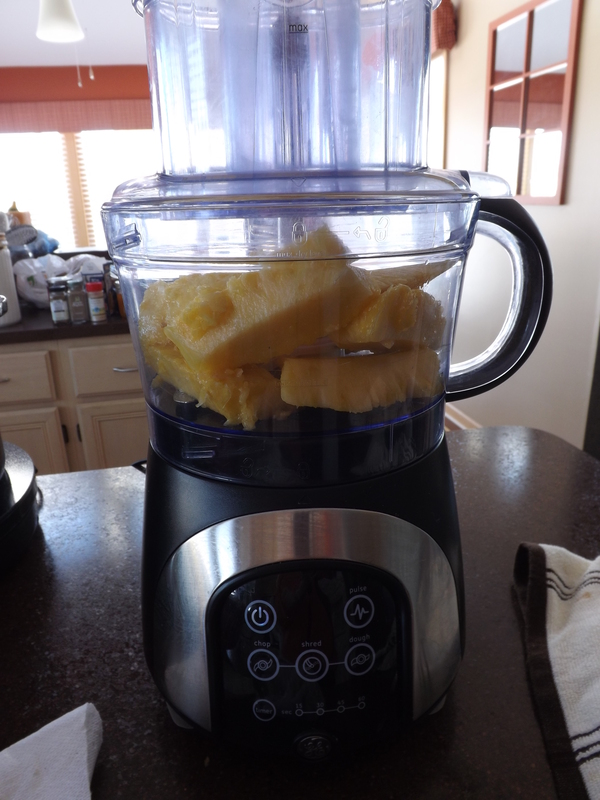 Next I place all the big chunks of fruit in a food processor. And I’ve got crushed pineapple. I then heat the pineapple just till it’s warm, fill hot jars with it, seal with bands and lids, and process for 25 minutes in a water bath. You’ll notice some little brown specs in my jars. These are seeds. I’m not particular when it comes to pineapple seeds. I figure there has got to be some nutritional value to them, so why bother trying to remove all of them. 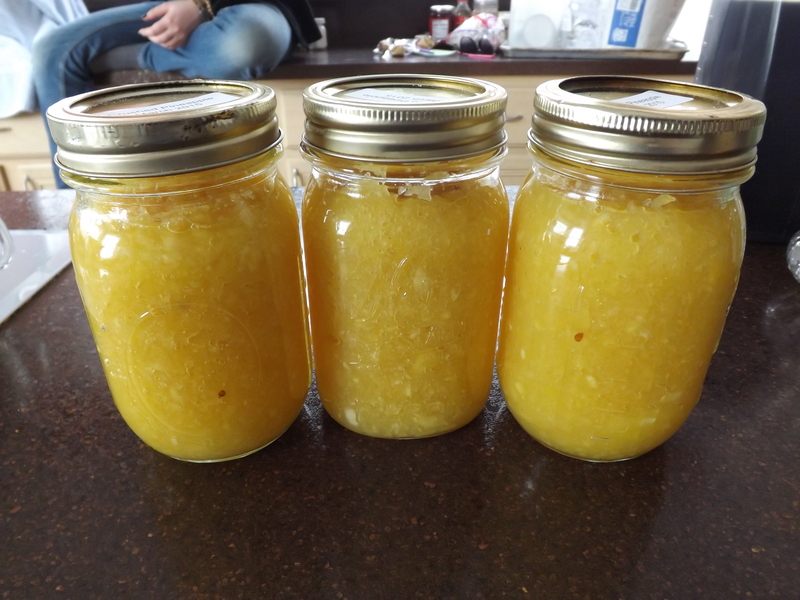 Home-canned crushed pineapple is super sweet and tastes just like fresh pineapple. Stocking the pantry with more than a dozen jars of pineapple should keep up happy for some time, and for this I am — Simply Grateful. March is the best time I have found to can homemade sauerkraut. Because of St. Patrick’s Day and the hype to serve corned beef and cabbage, every super market and specialty grocery store puts cabbage on sale. Typically cabbage is anywhere from $.33 to $.49 a pound. The first two and a half weeks of March though you can get it as low as $.14 a pound, which is exactly what I paid for it this year. At this great bargain price I bought six large heads of cabbage for less than $5.00 and with this I was able to get 8 1/2 quarts of sauerkraut. This will be enough until I buy the token couple of heads of cabbage at the fall markets just because I love to buy farm fresh produce locally whenever I can. I am not a big fan of fermenting cabbage or pickles in a crock. I find it more cumbersome than doing it in jars and less sanitary. For me, fermenting in a jar is the way to go. 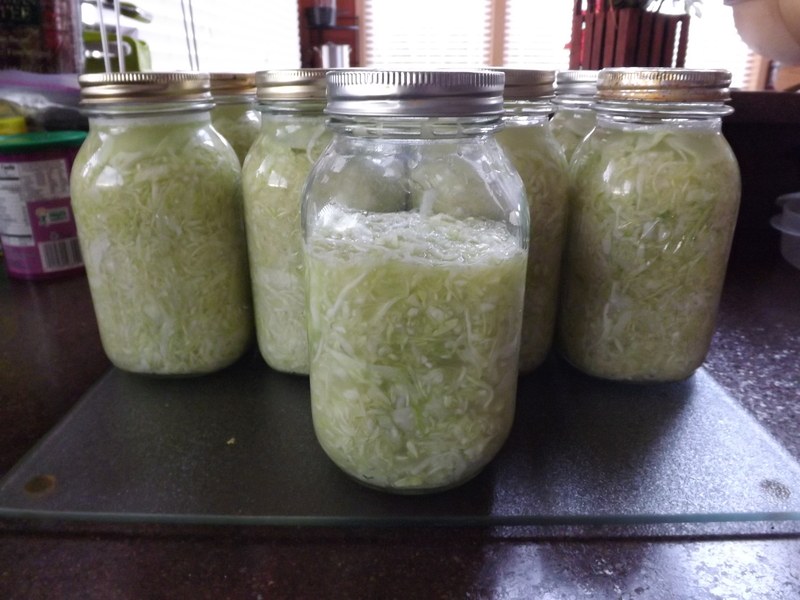 Sauerkraut in jars is so simple, it took me about three hours from start to finish. 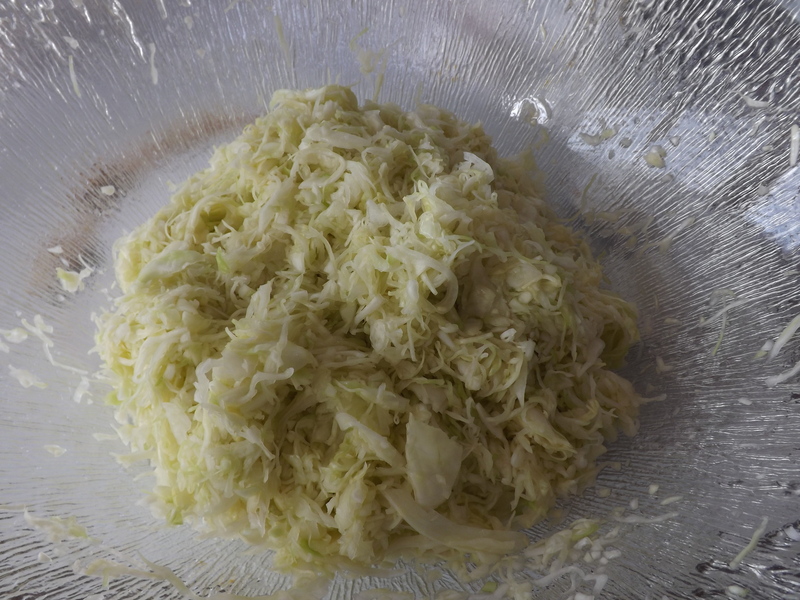 If I had used my food processor to shred the cabbage rather than a mandolin, the time would have been cut at least in half, but for some things I just like doing it a certain way. 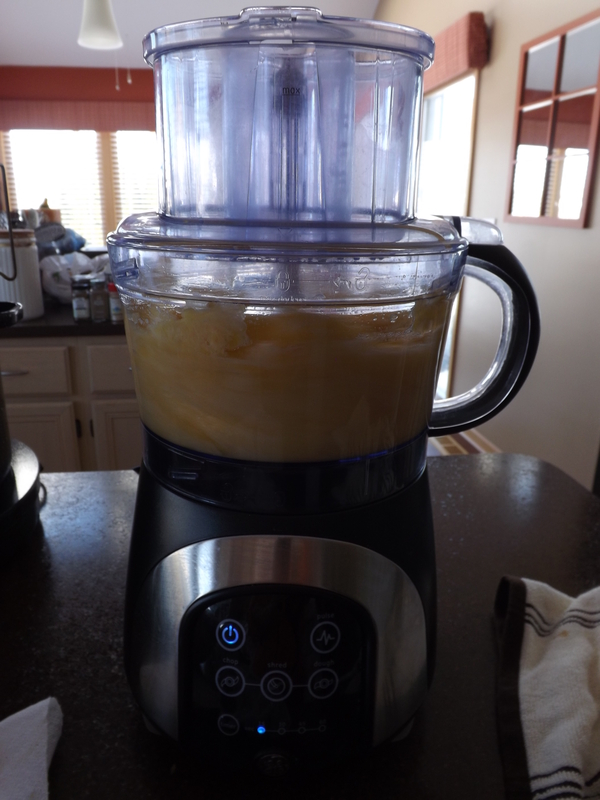 A food processor will shred the cabbage quick, but not as thin as I like it. My mandolin makes it paper-thin and then I use the chopping blade on my food processor to finish up any cabbage that couldn’t be done on the mandolin. The first step is to shred the cabbage to the desired thickness. The thinner the cabbage, the easier it will be to tenderize. Next you will add 2 tablespoons of pickling or sea salt for each head of cabbage. Massage and knead the salt into the cabbage, reducing the volume by at least half. 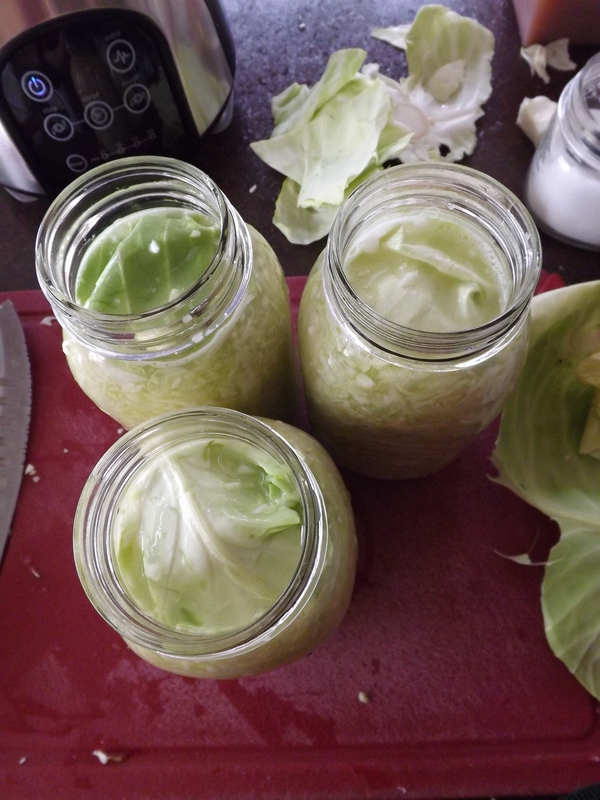 Squeeze the liquid from the cabbage and pack into clean quart jars. Add another teaspoon of salt as you are packing the jars. 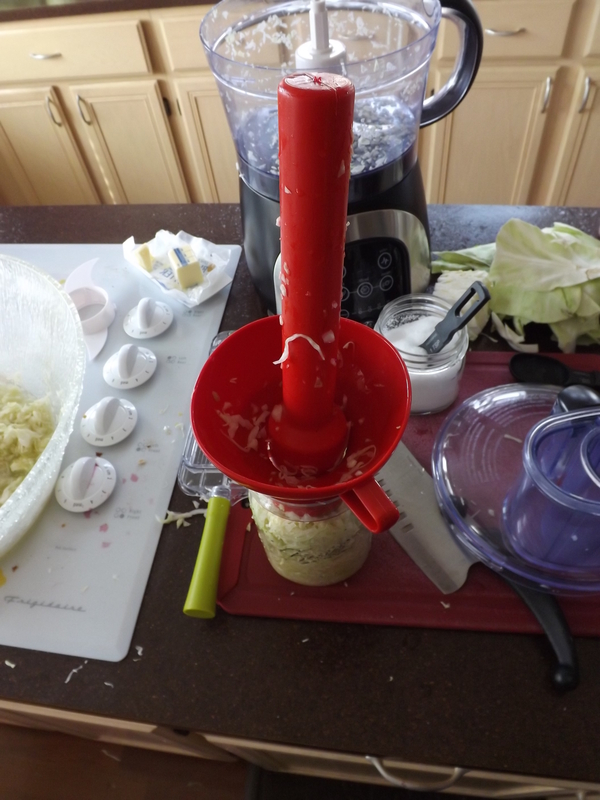 Be sure to really pack down the cabbage in the jars with a pestle This is crucial to remove excess air. 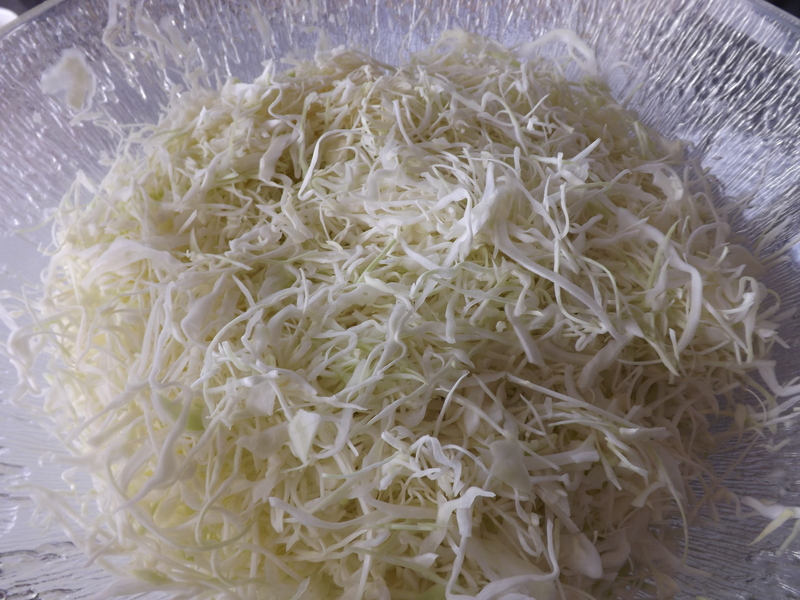 Once the jar is packed, add reserved salty liquid over cabbage and top with a folded leaf of cabbage. This leaf will help keep the sauerkraut from floating to the top. Cover the jars with clean lids and bands. Do not over-tighten bands as the jars will begin to ferment and liquid will need to escape. Sealing them finger-tight is good. Let jars sit in a cool dark place for at least three months. During the first couple of weeks you should check on the jars every other day or so to burp them. Also, check to make sure that the liquid in the jars does not fall below the folded cabbage leaf. If it does, add a salt brine to top it off. To make brine, combine 4 1/2 tsp. pickling/sea salt and 4 cups water. Bring to boil to dissolve salt. Let cool to room temperature. I usually make a jar of brine the same time I make the sauerkraut so I don’t have to worry about having to do it later. Once the sauerkraut has fermented for at least three months, you can remove it from the jars, heat, replace in clean jars and seal for storage. I typically let mine sit for at least 4 to 5 months, as we like it pretty sour. Some people don’t open the jars after they are done fermenting to re-jar them. I have mixed feelings on this. Although I have not always re-jarred them using the water bath method, I somehow feel more secure in doing so because I think it will prolong the shelf-life of the sauerkraut. I’m not a huge believer that botulism would be a factor here because the jars seal themselves during the fermenting process and we never got sick when we ate them without resealing them, but everyone should make their own decisions and do what they are most comfortable with. In a later post I will go into greater detail as to how to re-jar the sauerkraut, as my jars that were made in October are ready to be sealed now. Possibly next week. With St. Patrick’s Day over, so is canning sauerkraut for another year, unless I have success in planting cabbage in my garden this year, in which case I’ll be doing this again in October — keep your fingers crossed, and for this I am — Simply Grateful. Crisp: Exactly the same as a crumble without the oats. Cobbler: A baked dish of fruit topped with individually dropped biscuits. Buckle: A baked dish with a cakey batter on the bottom, topped with fruit. When it is baked the cake rises around the fruit and the whole thing buckles inwards. 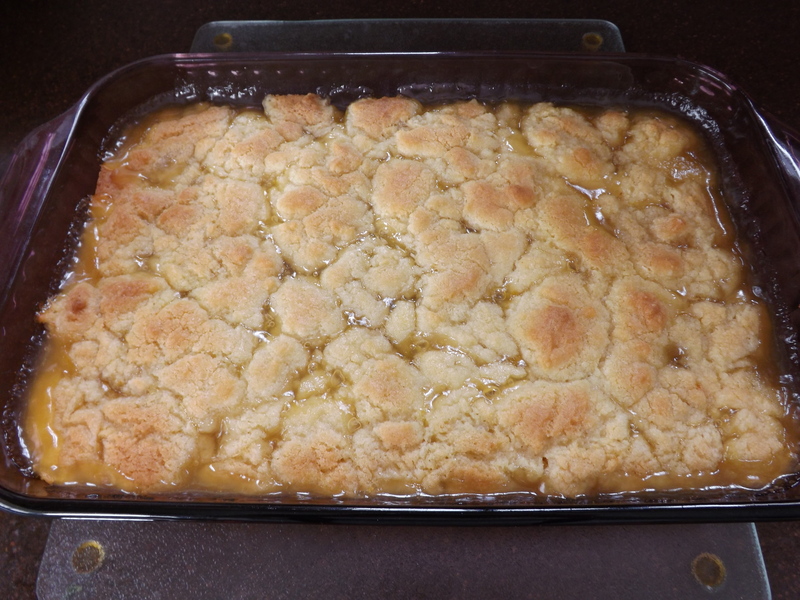 Grunt/Slump: A cobbler that is cooked entirely on the stove-top. The biscuits are steamed on top of the fruit. Brown Betty: This is the same as a crisp, but there is layer of streusel under the fruit as well as on top. Knowing this, I was able to decide which mix-in-jars I wanted to try next, my favorite of the group — Cobbler. Combine dry ingredients in bowl. Add melted butter and egg, mix until well combined. Grease 13 x 9 pan. Pour pie filling into greased pan. Top with tablespoonfuls of the cobbler mix. Pour mix in mixing bowl. 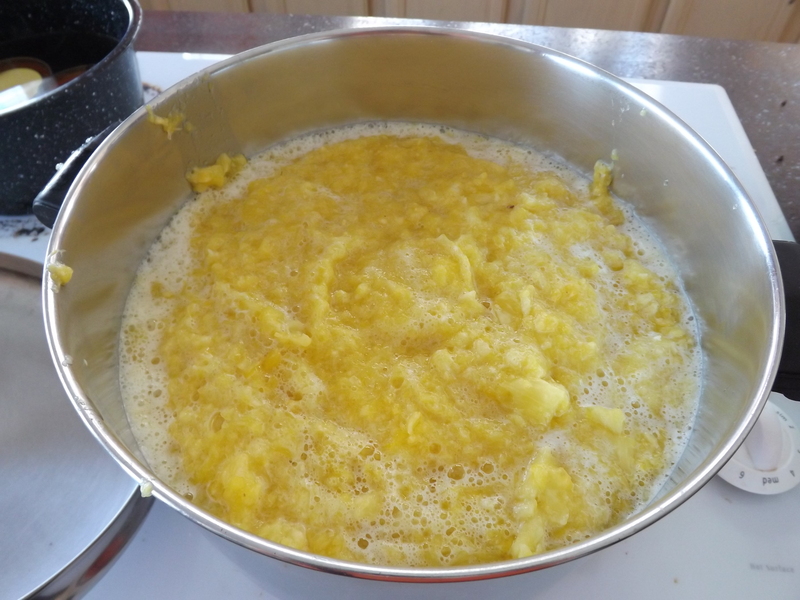 Add 1/2 cup melted butter and 1 egg, mix until well combined. Empty 1 quart and 1 pint pie filling into 13 x 9 greased pan. Top with tablespoonfuls of the cobbler mix. Bake at 375 for 30 minutes. I love this recipe because by using my own canned pie filling this dessert comes together in less than 5 minutes rather than 30 or more. Definitely a great time saver when getting home close to the dinner hour. Time saving and exceptionally tasty, and for this I am — Simply Grateful. I love English muffins, especially with kiwi-lime jam and butter. 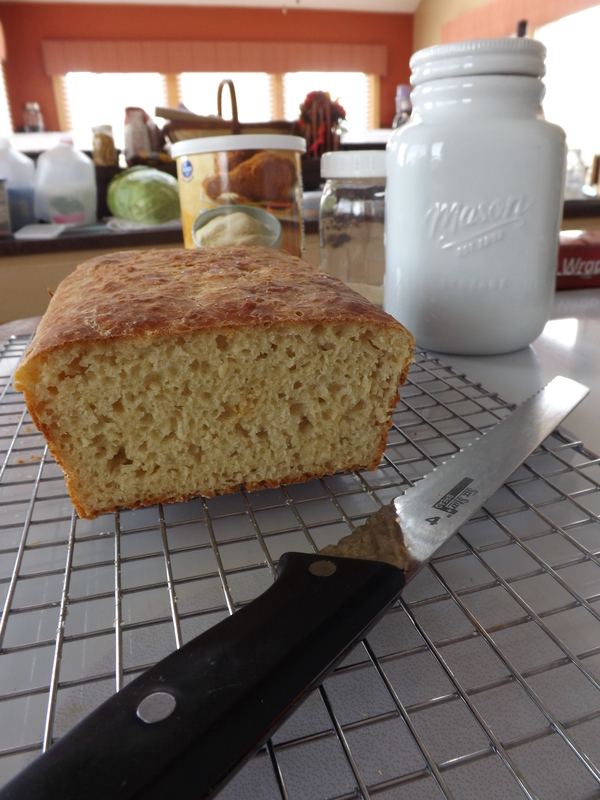 When a neighbor of mine gifted me a loaf of English muffin bread last fall however, I found a new favorite. Grace too enjoyed the bread, but the only trouble with the bread was it had buttermilk in it, and Grace can’t eat anything with homogenized dairy products without suffering stomach problems. The same reason why she has never been able to stomach store-bought English muffins. Grease loaf pan and dust with cornmeal. Combine flour, yeast, sugar, salt and baking soda in large bowl. Stir in hot milk until thoroughly combined. Cover dough with greased plastic wrap and let rise in warm place for 30 minutes or until dough is bubbly and doubled in size. Stir dough to deflate and pour in prepared pan. Cover pan with greased plastic and let dough rise another 30 minutes. Remove plastic wrap and bake in oven pre-heated to 375 for 25 to 30 minutes. Cool completely on wire rack. Grease loaf pan and dust with cornmeal. Empty mix and yeast in large bowl. Stir in 1 1/2 cups 120 degree milk until thoroughly combined. Cover dough with greased plastic wrap and let rise in warm place for 30 minutes or until dough is bubbly and doubled in size. Stir dough to deflate and pour in prepared pan. Cover pan with greased plastic and let dough rise another 30 minutes. Remove plastic wrap and bake in oven pre-heated to 375 for 25 to 30 minutes. Cool completely on wire rack. Slice, toast, and serve. All the recipes I found recommend toasting this bread before eating. In fact, several of them indicate it is essential. I followed the instructions and found the bread excellent. Hubby, however, being the rebel he is, had to be original and ate the bread without toasting it. He said it was excellent and ate several slices plain and then made himself a headcheese sandwich with a few more. So I guess toasting is optional. Grace has never been able to stomach English muffins bought from the store, so finding a recipe that she can eat because I use raw milk rather than homogenized dairy products is great, and for this we are — Simply Grateful. Now that Grace can drive, when she comes to me at 7:00 at night and says, “I want something sweet — I want muffins!” I can go to my list of recipes I want to try, bounce them off her until one clicks, and then send her up to the store to pickup anything we might not have on hand. This is exactly what happened last night when she proclaimed she wanted muffins, except she already knew that she wanted lemon poppy seed muffins. Thankfully I had a recipe already picked out and waiting for a trial, but there were a few things I didn’t have, so off to the store she went. While she was gone, I whipped up what I could, then filled in the blanks when she returned. In large bowl combine sugar, lemon zest, flour, soda, salt and poppy seeds. In small bowl, whisk sour cream or yogurt, eggs, vanilla, lemon juice, and melted butter. Pour liquid ingredients over dry ingredients and stir to combine. Don’t over mix. Divide dough among the muffin cups. Bake 4 minutes at 450 then reduce oven to 350 and continue cooking for another 12 – 17 minutes. To make a muffin mix in a jar, there are two options. Empty mix into large bowl (removing powdered sugar pack and setting aside). In separate bowl, whisk 3/4 cup sour cream or yogurt, 2 large eggs, 1 tsp. vanilla, 3 Tbsp. lemon juice, and 1/2 cup melted butter. Pour liquid ingredients over dry ingredients and stir to combine. Don’t over mix. Divide dough among muffin cups. Bake 4 minutes at 450 then reduce oven to 350 and continue baking for 12 – 17 minutes more. To make icing, combine 1 cup powdered sugar with 3 Tbsp. lemon juice. Instead of 2/3 Cup Granulated Sugar, I am going to use 1/3 Cup Granulated Sugar and 1/3 Cup Brown Sugar. I will add 2 Tbsp. additional melted butter. I am going to decrease the flour by 2 Tbsp. Instead of the lemon zest, I will use 1 tsp. Pure Lemon Extract. Also, the original recipe called for large eggs. My eggs were medium-sized. I will increase the eggs by 1 if I don’t have large eggs available. Lastly, I used sour cream when I made these. Next time I am going to try homemade yogurt. 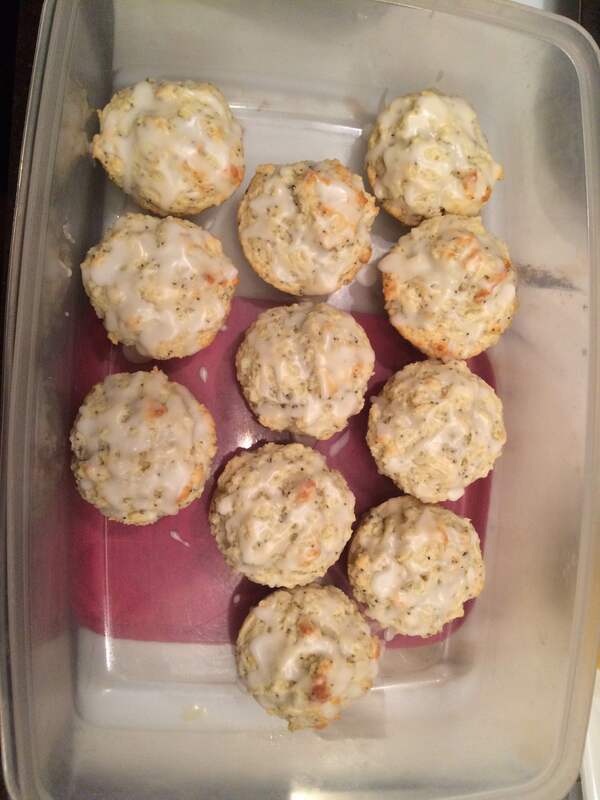 Even though these muffins were a hit with the family, I know I can make them better. The more I bake, the more I learn how to make adjustments so recipes can become exactly the way I want them to be, and for this I am — Simply Grateful. Planting seeds in two different types of medium has proven to display some definite differences. Although far too early to make any definitive conclusions, these results are certainly interesting. 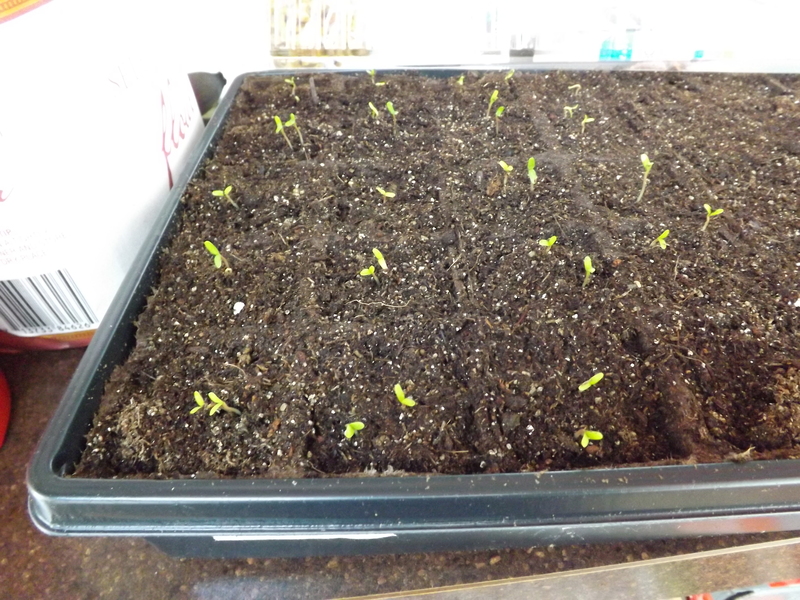 This morning when I checked on the progress of the planting I did just four days ago, I was pleased to open the lid of the Jiffy pot tray and find a few marigold seedlings. I planted marigolds for several reasons, one being that I figured if these grew, there would be no reason the other seeds would not, as marigolds are easy to grow. The other seeds I planted have a longer germination period, so I don’t expect the other plants to start showing up for at least a week. 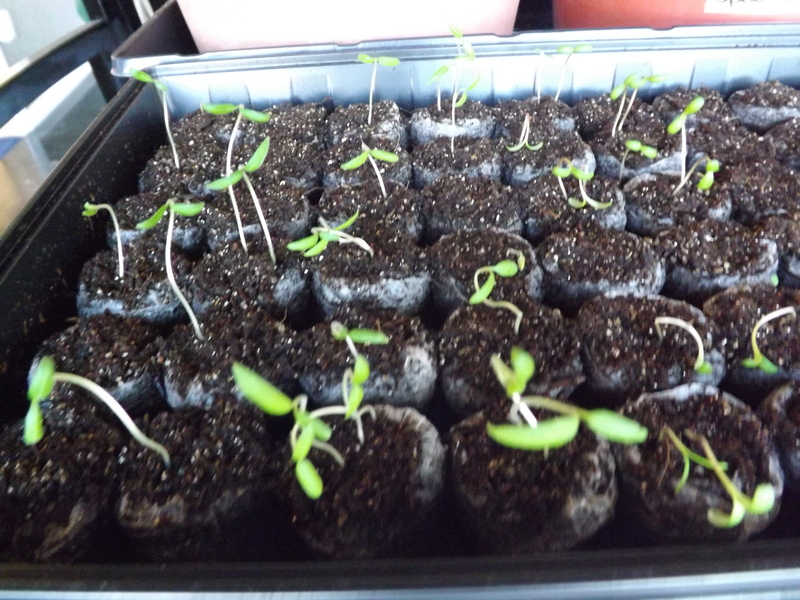 Seeing that the seeds have started to sprout, proves to me that this method of growing plants should work. Although I’m sure some plants are easier and heartier to begin from seed, I am encouraged that with my marigold success I might have success with my other plantings. 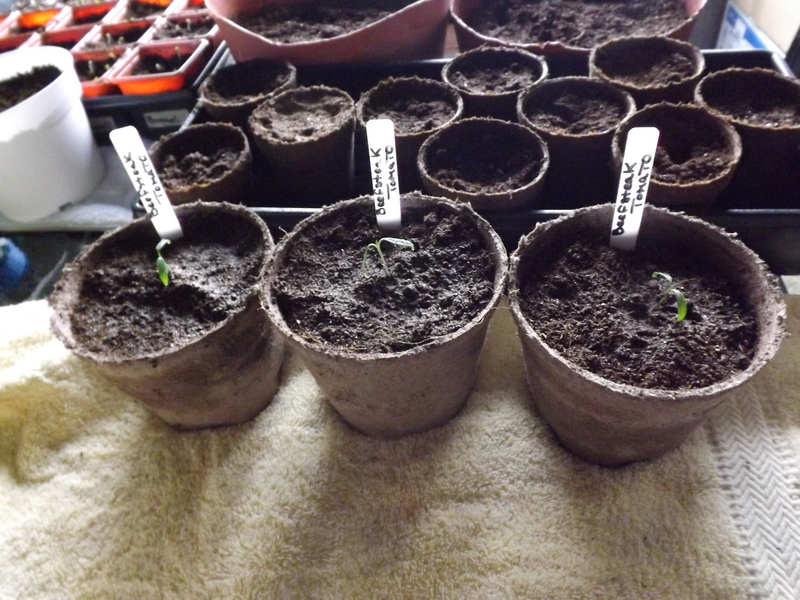 Moving to the tray of seeds I planted using a cardboard-style pot with a garden potting mix, I was completely surprised to find every marigold seed had sprouted. I’m not saying every pot had a plant, I’m saying that every seed, as I put two per pot, had sprouted. Wow! A definite difference. This test, if taken completely out of context, might indicate that the cardboard planters and garden potting mix is the way to go, but it is still early. There is nothing to indicate that the jiffy pots will not still sprout. What I can conclude though, is that the cardboard planters and potting mix worked faster. If there is only a day or two difference, this is not a big deal. Also, there is still the question as to which plants will be healthier, those planted in the Jiffy pots or those in the cardboard planters, if there is a difference. For now, I am just grateful my marigolds have sprouted. It gives me hope for the remaining plants, and for this I am — Simply Grateful.